Like many gardeners, I've been unfortunate enough to experience some brassica damage in the past. 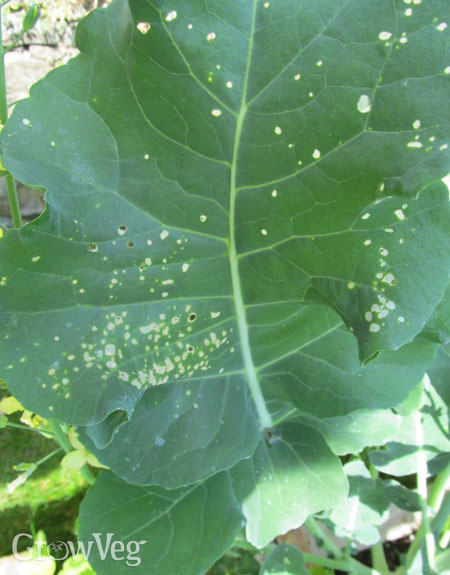 A few tattered rutabagas, a holey kale plant – tell-tale signs that Small Cabbage White butterflies had laid their eggs on my plants. I considered the damage annoying, but it never reached really troublesome proportions in my garden. It turns out that the Small Cabbage White butterfly, while undoubtedly a pest, is nothing compared to its big brother, the unimaginatively-named Large Cabbage White. The two are very similar, but the caterpillars, or cabbageworms, are distinct – the Small Whites are an unassuming pale green colour, while the Large White larvae sport a hairy black and yellow jacket. As the name suggests, cabbages and other brassicas are the favored food plants of the Cabbage White larvae. The butterfly will lay eggs on the undersides of leaves (singly in the case of the Small White, in groups of 40-100 by the Large White) and after a week or two the larvae will emerge, like the Very Hungry Caterpillar in my favorite childrens' book, ready to eat whatever lies in its path. Small Whites will tunnel into the hearts of cabbages, so even if they're around in fewer numbers, a handful of larvae can still do serious damage to your crop. Cabbage Whites produce two broods per year (three in a favorable summer), so make sure to install the netting in spring and don't remove it until autumn. Even under netting however, regular inspection of leaves is essential. Hand-picking eggs and larvae off the plants can be laborious, but it is effective. Small White larvae are well-camouflaged, so make sure to check the ribs of leaves where they often hide. Growing red-leaved varieties of cabbage and other brassicas can make it easier to spot them. Large White cabbageworms can fall prey to the larvae of Apanteles glomeratus, a parasitic wasp, which devours the caterpillar from the inside out, carefully avoiding the vital organs so the host continues to grow to full size. If you find any dead caterpillars with yellow cocoons next to them, it might be worth moving them among your brassicas so that the parasites will attack further generations.